Posted on 30 June 2016 under Book Review & Literature, Pacifism, Theory. 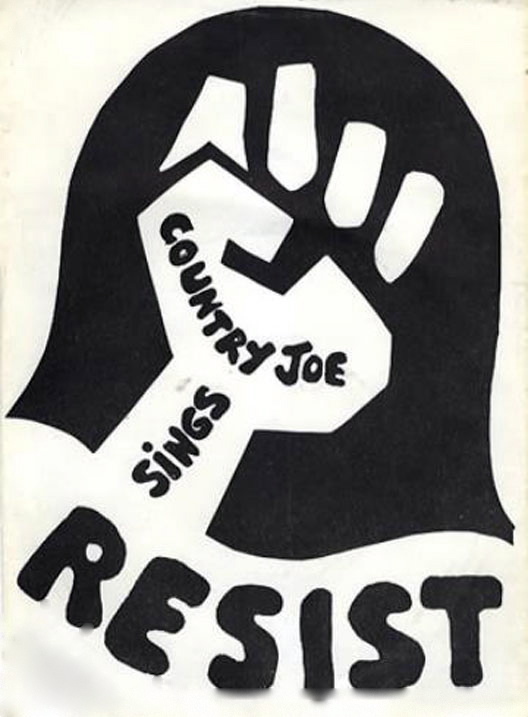 Country Joe McDonald has carried on the spirit of the 1960s by singing for peace and justice, speaking against war and environmental damage, and advocating fair treatment for military veterans and homeless people. Only two weeks later (June 16-18, 1967) the Monterey International Pop Festival brought together an extraordinary gathering of some of the most creative and innovative musical artists in the world, including Jimi Hendrix, the Who, Janis Joplin, Jefferson Airplane, Otis Redding, Booker T. & the MGs, Ravi Shankar, Canned Heat, the Electric Flag, the Mamas and the Papas, the Byrds, the Animals, and Country Joe and the Fish. Taken together, those two momentous events — the Beatles’ imaginative and beautiful album, and the epochal gathering of legendary artists at Monterey — seemed to announce the dawning of a rebellious and visionary counterculture. The first rays of sunlight in the darkness of a world at war. It now may seem like a half-remembered fragment of a dream, but those days were filled with the hope that momentous social change might emerge suddenly from almost any protest, and breathtaking moments of beauty could be found in almost any music store or concert hall. It’s easy enough now to ridicule the 1960s counterculture, and cynically reject those bygone hopes of social change. But I never surrender to that cynicism. For, in the midst of the cruel injustices of the Vietnam War, and in an era marked by napalm and hydrogen bombs, widespread hunger in America, and brutal attacks on civil rights demonstrators, a new generation of musicians began singing about peace and love, and a new generation of activists launched a rebellion against war and social injustice. It may have been a lamentably short season of peace and love, but it was utterly beautiful to see those values blossom seemingly everywhere. For one of the few times in our nation’s history, a generation rejected war and greed, and declared that love was the supreme value. “A Love Supreme proclaimed John Coltrane in his classic 1965 album. “All You Need Is Love” the Beatles sang in 1967. Love in action was the new form of social change pioneered by the civil rights movement and then embraced by the peace movement and the counterculture. Today, the countercultural visions of peace and love seem as distant as “strange news from another star,” in Hermann Hesse’s phrase. Yet in 1967, strange news from another star — the strange message of love and kindness and revolutionary change — could be seen on evening newscasts or heard on car radios. That’s what the records of Country Joe and the Fish evoke — the imagination and hope of the 1960s. In December of 1967, the winter after the summer of love, when I was in my early teens, I walked into a music store and the sight of three wildly imaginative new records struck like the force of revelation. I still play them to this day: Disraeli Gears by Cream, Magical Mystery Tour by the Beatles, and I Feel Like I’m Fixin’ to Die by Country Joe and the Fish. Those surrealistic and riotously colorful album covers amazed me at first sight. An epiphany in a record store. The flowering of the counterculture. The cover of Disraeli Gears exploded in swirling psychedelic images of day-glo orange, magenta and pink, and the songs inside — “Tales of Brave Ulysses,” “Strange Brew,” “Sunshine of Your Love” and “SWLABR” — merged the surging electric blues guitar of Eric Clapton with the mind-expanding excesses of psychedelic distortion. The album’s other brilliant songs — “I Am the Walrus,” “All You Need Is Love,” “Penny Lane,” “Fool on the Hill” — expressed the deepest dreams of the counterculture. John Lennon’s anthem, “All You Need Is Love,” was the perfect song for the Summer of Love, and made a deep impact on the world. The whole world was watching when the Beatles performed it live on June 25, 1967, for an audience of 400 million people in 25 countries on a broadcast of the first live global TV program. Already floored by Cream and the Beatles, I next saw the madcap cover of I Feel Like I’m Fixin’ To Die, with Country Joe and the Fish posed in a parody of Sgt. Pepper’s. The Beatles’ Technicolor band uniforms were mocked by Fish finery: the cigar-chomping Chicken Hirsh in a beanie cap topped with propeller, David Cohen casting a spell as a tacky-looking sorcerer, Barry Melton in a Civil War uniform, Bruce Barthol with an apple stuffed in his mouth, and Joe McDonald as a peasant revolutionary with sombrero and rifle. The three albums were entrancing — revelation in a record shop. A world that had been trapped in gray conformity suddenly had become a place of dazzling enchantment. It felt like the winds of change were breezing through the store. Those images and that music left a lasting imprint — symbols of the spirit of peace, love and beauty in the 1960s. Today, the ongoing critical re-evaluation of the music of the 1960s has greatly elevated the musical reputation of Country Joe and the Fish. The band is now more highly renowned than ever, and their first two albums have won new acclaim as under-rated masterpieces. Country Joe and the Fish disbanded at the end of the 1960s, but McDonald went on to make music that carried on the spirit of the ‘60s. In 1969, he released Thinking of Woody Guthrie — to my mind, the finest tribute album ever recorded of Guthrie’s music. Daniel McMullan, an advocate for homeless and disabled people, had loved Country Joe’s music when he was young. Decades later, after he moved from New York to Berkeley, he was inspired to see McDonald upholding those ‘60s ideals by supporting homeless benefits and protests. In May of 2010, McMullan joined East Bay activists in organizing Arnieville, a tent city on a traffic island near the Berkeley Bowl that was set up to protest Gov. Schwarzenegger’s budget cuts to social services for poor and elderly people, and cuts also to In Home Supportive Services. The organizers held a concert for the homeless and disabled people staying in the tents. EDITOR’S NOTE: Terry Messman, a regular contributor to this site, is the editor and designer of Street Spirit, a street newspaper published by the American Friends Service Committee and sold by homeless vendors in Berkeley, Oakland, and Santa Cruz, California. Please click on his byline to view his Author’s page, for an index of his interviews and articles. Country Joe McDonald’s personal website is a lively source of information about him, his recordings, and books by and about him.